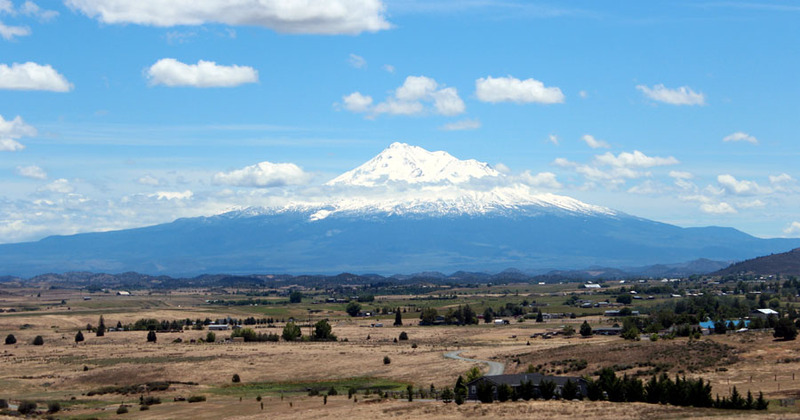 Mt.Shasta is sort of like Mt.Fuji for us northern Californians… a spiritual mountain, glorious with it’s snow topped peak. We stop in the town of Mt.Shasta for great coffees and lunch on our way to Oregon; this time for Western Teachers’ Workshop. 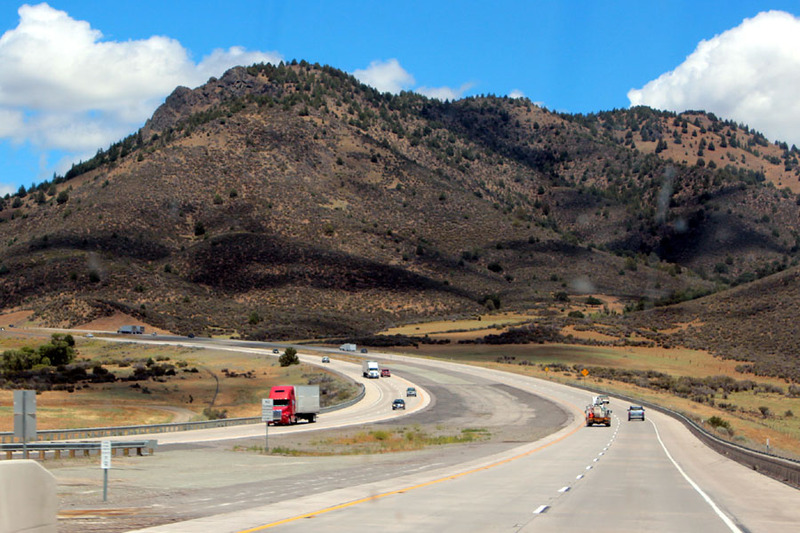 The more we travel up and down this highway, the more these mountains become familiar landmarks of our trip. another hill further up the hwy has a barn roof visible from the road with an American Eagle painted over the entire roof. Before Yreka, on the north side of the hwy, there is a large metal cow howling a warning, or is she howling at the moon? Several years ago, she gained a metal calf beside her, howling too. Once we arrive at Riley Hall in Eugene, we settle in for a week of teaching practice and inspiration. A Tuesday class, ‘Textured Geometrics’, presented by Cheryl Salzberg was a fun exercise in trying various fibers in our hooking; lace, ribbons, slinky materials, etc. Cheryl also shared a fun textured wool that was white with black specks on one side and black with white specks on the other. it is used to good effect in the ‘Little Quaint’! 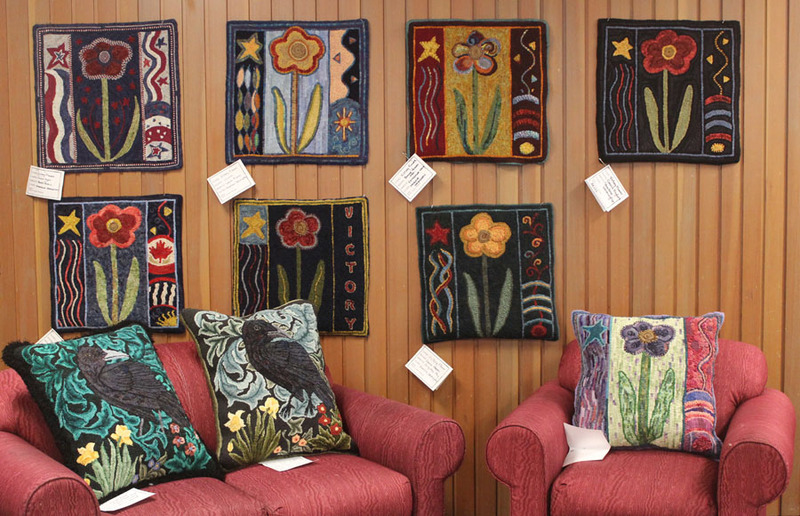 Each year, we have a rug show at Western Teachers’ Workshop, on Thursday. Roxanne and Jennifer Dotson organized and put up the Rug Show with the Junior class. It is always a great show of our teaching projects and our own original designs. 8 ‘Victory Flower’ rugs and 2 William Morris Crow pillows. Some of the patterns we teach are so much fun, they come back and make a splash at the rug show. Victory Flower is 20×20″ and fun to personalize and hook! You can order it from Honey Bee Hive, our new McGown certification sponsor. Suzi’s rendition of this new pattern from Honey Bee Hive is so striking! I love graphics and the black and white backgrounds really set off the design! I wonder what other colour plans we could do with this design. Lynn always wows us with her colour sense and this piece is even more amazing… extra wide strips fill the petals and high and low medium strip make up the flower center. 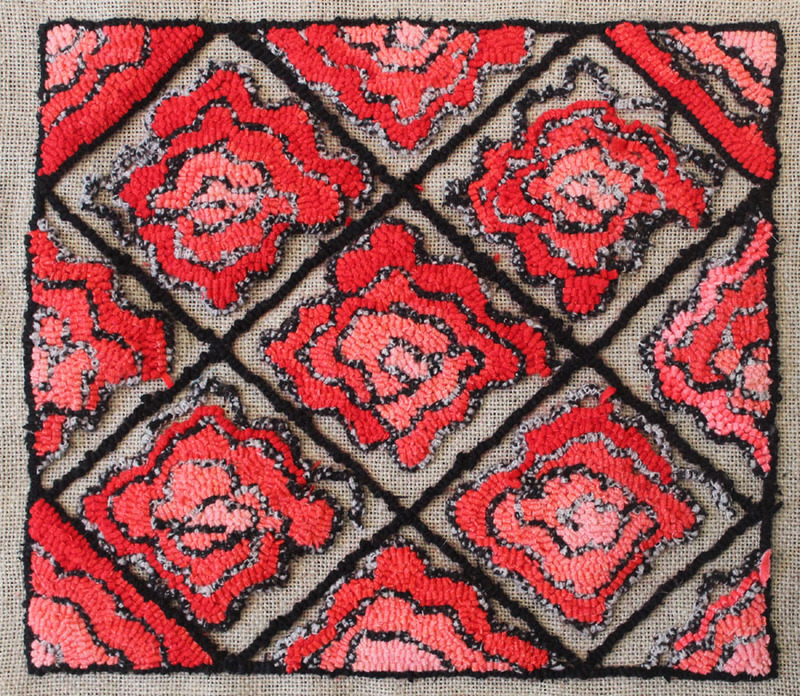 A beautifully crocheted edge finishes this rug perfectly! 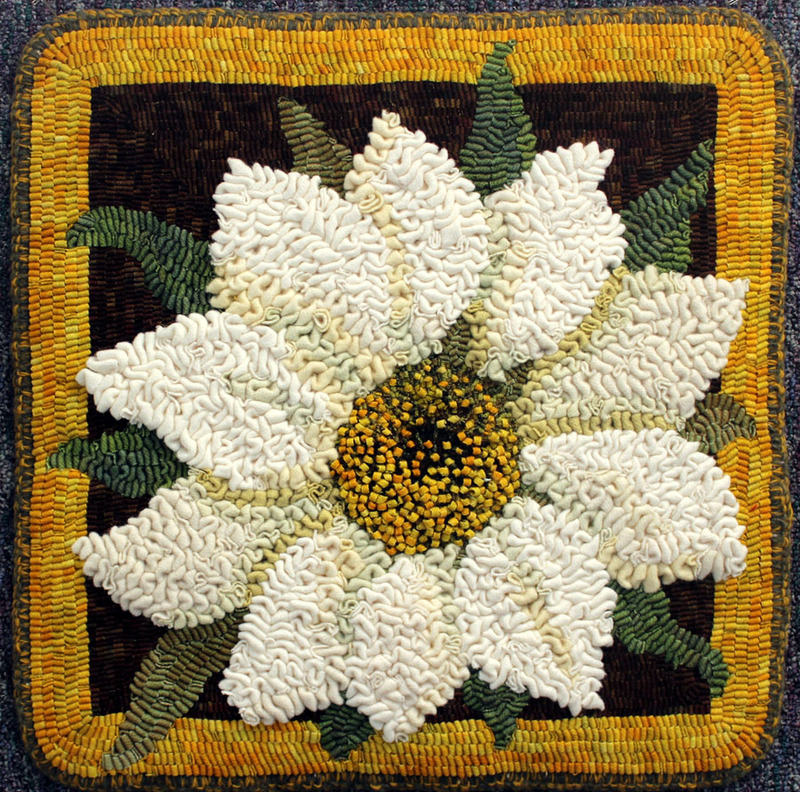 Central in the Rug Show this year, was a tribute to the late Polly Clark; mentor and friend to all. Polly hooked her cheerfulness into all of her rugs; with a bit of pink! I’ll show more of her rugs next time. « A jaunt to the Cambria Rug Show! Very nice article about the trip to Western. Just a little note; the cow and calf are just south of Yreka, not Yakima. I have seen those cows many times, as my folks live just a couple miles up the road from them. Also, how about that dragon when you are coming out of Yreka heading toward Oregon? Pretty cool. thanks for the correction… yes… Yreka! and i do love the dragon just before that view of Mt.Shasta that i posted. didn’t have my camera out quick enough. next year. the dragon is starting to look a little worn out… i hope he lasts the winter. 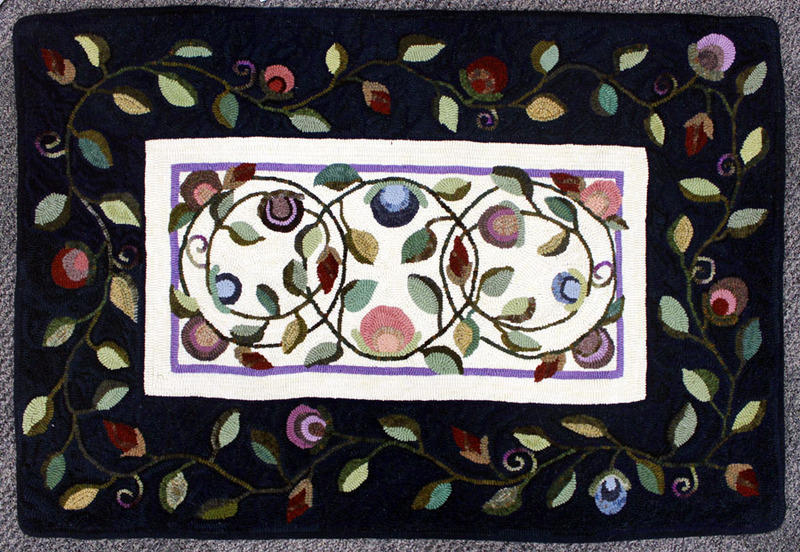 I attended the rug show and thought the flower hooked by Lynn was breath taking, as I love wide cuts. The show is also a time to buy some wool, touch and feel, instead of computer screen, so am grateful for the vendors. 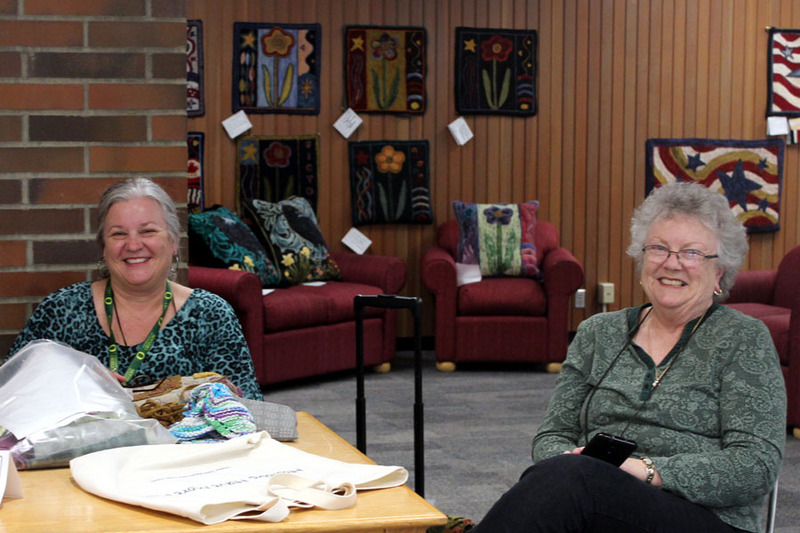 glad you were able to come to the Rug Show and shop with our vendors too. it is handy having vendors during our week of classes. Looking for a rug hooking pattern that depicts nautical setting in the northwest. Grandson is 2, and rug will be for his room, with a seas life etc theme.